Spendwise Moms: Dollar a Day Challenge: Could You Do It? Dollar a Day Challenge: Could You Do It? Several years ago, I had found a sale where you could purchase TV dinners for only 38 cents each. Even though we aren’t fans of frozen meals, it made me think of how inexpensively you could eat if you could get deals like that. You can’t buy a meat, potato, and vegetable for 38 cents if you were to buy them alone. I counted the different kinds of meals they had and realized that you could buy a frozen dinner for lunch and dinner every day of the week for a whole week without duplicating them. You could also buy bananas and some cereal and milk or eggs or something else to last for breakfast for the whole week and still stay in a $1 per day budget. Several people have tried this challenge for a month. Some did well staying in their budget and donated food to a food bank as well. Others had very boring meals or had the same meal over and over. Our family tried this challenge for a week. We did pretty well, but had to eat smaller portions and it was a big challenge to get five fruits and vegetables for each person every day. Could you live on $1 per day? If I had to do it, I could. I would not enjoy the extra time and effort it takes in planning, cooking and shopping carefully. And, going to someone’s home and having them feed you all of your meals is not an option! Where would you start? First of all, set aside 7 dollars a week for each person in your household. That is a dollar a day per person. If you live by yourself, it would be wise to plan your meals over an extended period of a couple of weeks or a month. That way you have more money to work with, and you can freeze extra portions for later. Next, find recipes with inexpensive ingredients calculate the cost to make them. I can make two small loaves of sourdough bread for only 12 cents. Think of inexpensive produce you can buy. Carrots, potatoes, bananas, and onions are in that category. Sometimes I can even find bananas for 20 cents a pound if they are ripe. If you eat ½ banana per day at that price, your money will go far. Find marked down items, especially produce or meat. By going to the store more often, I was able to get some good produce deals that made meals more interesting. Use the bulk food section of your store. Even though the prices may be a little higher per pound, you have the option to only buy what you need and no more. Be wise about portion control. I found that we ate more than we really needed on a regular basis. Cut out snacks and use your money for healthier foods. Think of ways to get free food. By using coupons, you can greatly reduce the price of food or even get it free. I am amazed at what some people can do with coupons. Some can double or even triple the coupons. You can also get free food from trees in your backyard or from your garden in the summer. Watch the free ads in the paper. Many people want to get rid of the fruit on their trees and you can get as much as you want for the picking. Sometimes pharmacies offer $25 of groceries with a transferred prescription. That is a lot of food for free! Think outside the box. Costco has free samples if you want to taste something different that just won’t fit into the budget. Since I pay for the card at Costco, I don’t think it is wrong to go in and get samples even if you don’t buy something. The fact of the matter is that they offer the samples to get you to buy the product. They don’t give them just because they are nice. If you are trying to be frugal, but are craving something sweet, you can go by the bakery at your local grocery store when you shop and enjoy a free sample if they offer them. Don’t be dishonest. If you go inside a fast food place, it isn’t right to take more than you need for the meals or item you purchase. But, if you go through the drive through for a $1 burger, ask for condiments to go with it. Sometimes they are very generous and you could end up with extra that will help to add variety in your food. Have friends over and do a potluck meal. You could make homemade tortillas and let people bring toppings to go on them. You could make homemade bread and have people bring toppings for a sandwich. Occasionally, restaurants have free meals. For example, IHOP had a free pancake day and Denny’s had a day where you could get a free breakfast. I have seen fast food places offer free tacos. Some other restaurants offer incentives to join their e-club. You can get free chips, desserts, etc. Sometimes you have to purchase something, but other times you don’t have to. Around your birthday, many of these restaurants will send you coupons for free meals. By using these ideas, you can eat for much less, maybe even $1 a day. 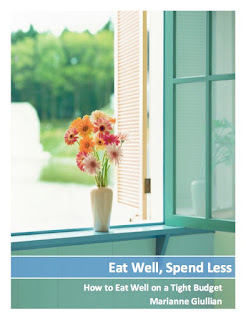 It takes more time and effort to eat for less, but there are significant savings.